I guess I've been MIA again but I have been making stuff and just haven't gotten around to posting them. 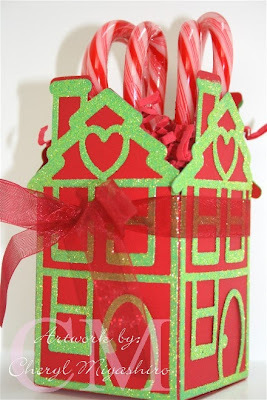 Here is another version of the gingerbread house bag die that I used on the post below this. I like to play with the dies that I have and use them in different ways. I made this into a box instead of a bag so it could hold more treats. It can be used as centerpieces on a table. 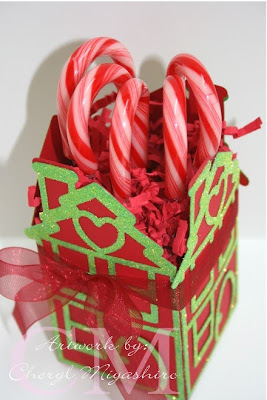 I put a piece of styrofoam at the bottom of the box and stuck all the candy canes in it. Then filled it with shredded paper. The outline of the windows and door is glittered with green Doodlebug glitter. You can email me if you want the instructions on making this bag die into a box. This is the pink mini album that we made last week for the make & take at the store. Everything was pink since it is breast cancer awareness month. 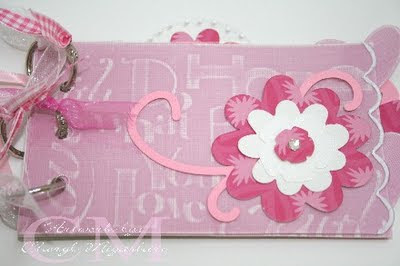 Well, the weekend is here and I will be working on my scrapbook album once again which explains why I have been MIA. Thanks for stopping by and have a great weekend!!! the box you made is cute and unique! it was fun going to the make and takes at j's! Gosh, Cheryl how do you have time to work on a scrapbook? I gave up thinking that I will ever update mine. I'm still 10 years behind! LOL The box is very attractive. Very pretty! Love it Cheryl. Cute box! I couldn't imagine it when you explained it to me, but I love it! The pink book is so cute too! Too bad I missed the M&T...too busy shopping at Vickies! haha! See you soon! Wow, the box is so cute! I love how you come up with other creative ways of using the dies. Such a festive box, Cheryl!!! Where did you find candy canes so early?? I couldn't find any last week when I was looking for them. what a great idea...to turn the bag into a box! this is perfect for center pieces...what pretty pink make n takes! love it! hope you have a great week!